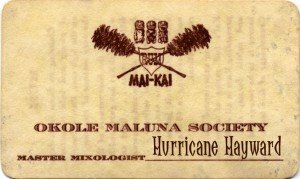 While earning my Okole Maluna Society card by reviewing every cocktail on the legendary tropical drink menu at The Mai-Kai, I learned quite a bit about the history of these tasty concoctions. 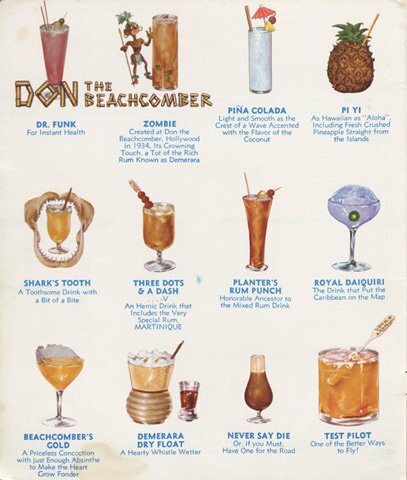 I knew that many were based on the classic templates laid down by the godfather of Tiki mixology, Donn Beach (aka Don the Beachcomber). But I had no idea that total would hit 40 as I discovered more “ancestor drinks” along the way. 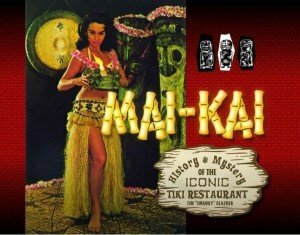 Of course, many of these were reinterpreted by The Mai-Kai’s late, great mixologist Mariano Licudine, under the direction of owners Bob and Jack Thornton. Licudine worked for Don the Beachcomber for 16 years before the Thornton brothers spirited him away to the grand Polynesian palace they were building in Fort Lauderdale in 1956. By the time Licudine retired in 1980, they had firmly established a tropical drink menu that not only still holds up, but puts most trendy craft cocktail bars to shame. Hurricane Hayward (left) with Mai-Kai owner Dave Levy, April 2011. 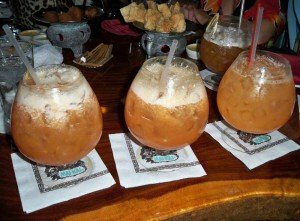 Below is a list of all the cocktails listed by their ancestry, to the best of my knowledge, plus a still-growing list of more than 90 recipes. The main page of the cocktail guide lists all the drinks by rating and by strength, but I thought it would be interesting to trace their lineage and list them here for the true cocktail geeks. Don’t forget to click on any review of a current drink to rate it on a scale of 1 to 5 stars. I’d like to see what you think. I’d also like to use this space to send out a huge mahalo to owner Dave Levy, manager Kern Mattei, marketing director Pia Dahlquist and everyone else at The Mai-Kai who makes it the special place that it is. 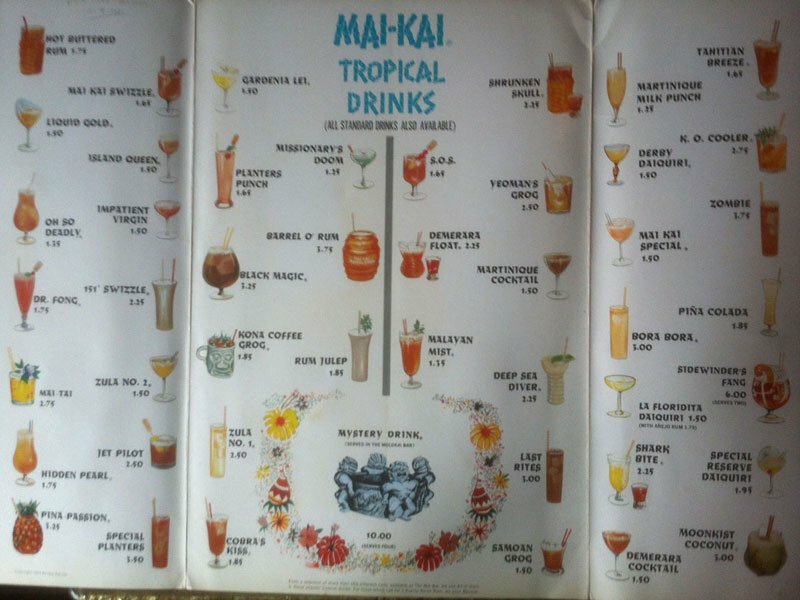 Also, much gratitude to two people without whom this guide probably wouldn’t exist: Author/mixologist Jeff “Beachbum Berry,” whose six books on tropical drink history are beyond essential; and Mai-Kai historian Tim “Swanky” Glazner, who keeps the stories and spirit alive through his great research and reverence for The Mai-Kai. Based on research by Hurricane Hayward for The Atomic Grog. Click on hyperlinks for full reviews and recipes. Drinks are listed in alphabetical order with ratings in parentheses, 1-5 stars. Click here for the full list organized by rating. ** Note: The main cocktail menu contains 47 tropical drinks, but our tally is 48. This is because the Wahine Delight moved to the dessert menu during a May 2018 update, but we’re still counting it on this list of classic cocktails. 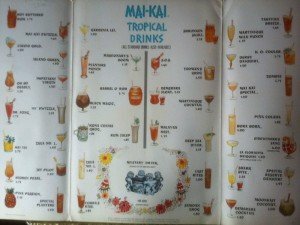 A 1970 Mai-Kai cocktail menu still includes many early classics that later disappeared. 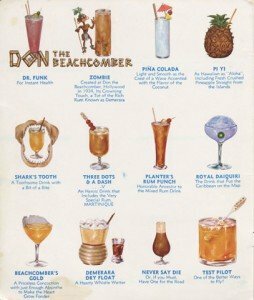 We’ve also identified 11 cocktails from the 1956-57 menu that were “retired” at some point prior to our research, plus one off-menu classic. We’ll be posting more info on the history of these classics, so stay tuned as we continue our journey back in time to some of the best cocktails ever created. This entry was posted in Cocktail reviews, Cocktails, Cocktails, History, Mai-Kai, Recipes, Rum and tagged Beachbum Berry, Don The Beachcomber, Fort Lauderdale, Mai-Kai, Mariano Licudine, rum. Bookmark the permalink. Great piece of work. You should be proud! Great work. 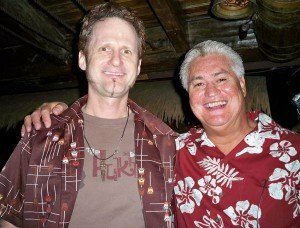 I’ve been in touch with Jeff, and my sister and I might have a few things to share at next year’s Hukilau. Aloha! I’m a big follower from the history of the Mai-Kai and I love how detailed this posting was. I learned a few new things. Big Mahalos from NYC (an ex-resident from Sofla). Mahalo Chi-Chi. Beachbum Berry’s new book, “Potions of the Caribbean,” has revealed the ancestry of several more current and retired Mai-Kai cocktails. We’ll be updating this page soon with more history.